We have uncovered a Carter stall condition, on fast brake stops, caused by gas washing from the float chamber into the passage leading from the barrels to the vacumatic piston chamber (indicated by “A” in Figure 8). This, in turn, is caused by deep nicks or scratches in the gasket seating surfaces of the passage (“B” in Figure 8) or by a warped bowl cover. Examine the passage seating surfaces for nicks (“B” in Figure 8). Minor nicks and scratches can be removed by polishing the main body with fine emery cloth on a surface plate It is essential to use a surface plate because stock removal must be uniform over all gasket surfaces on the main body. If the nicks cannot be satisfactorily polished out in this manner, it will be necessary to replace the main body. Check the bowl cover for proper alignment with a straight-edge. It is necessary to place the straight-edge in a position that is free of interference from the gasket seating ridges around the outer rim of the cover and around some of the mounting screw holes. Two suggested locations are shown in Figures 9 and 10. Check for contact at points indicated by arrows. If the cover is high in the center (as installed), install with two cover gaskets and tighten-down on the inner mounting screws. Remove cover and recheck. If alignment is then satisfactory, reinstall cover with one gasket. If the cover is low in the center (as installed), install with two cover gaskets and tighten-down on the outer mounting screws. Remove cover and recheck. If alignment is then satisfactory, reinstall cover with one gasket. If Step 3 fails to correct the warpage, two gaskets may be permanently installed. 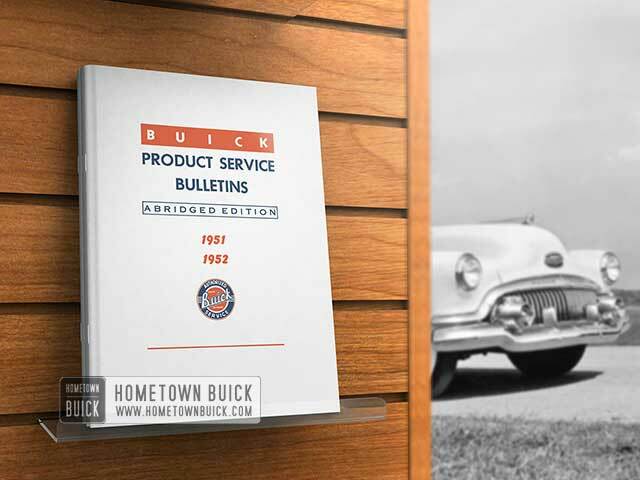 It is then necessary to reset the metering rods as outlined in Section 3-E, Paragraph 3-24 (Step 23) on Page 3-37 of the 1951 Buick Shop Manual. Fuel level should also be checked and corrected if necessary. In the event that Step 4 also fails to correct the stalling condition, it will be necessary to install a new bowl cover. A different bimetal is used in the optional coli so that it will retain the properties of the original coil. The present choke setting procedure is also applicable to jobs with the optional coli. A few cases have been found on 1951 Series 40 Dynaflow jobs, where the throttle operating rod is bent in an incorrect direction. 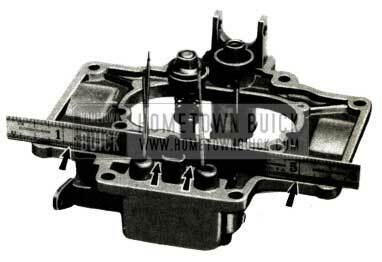 This prevents the throttle shaft from closing properly from the wide open position. If this condition is encountered, the rod should be removed and reworked by bending in the correct position (see Figure 12). After the rod is reinstalled, throttle linkage and dash pot adjustment should be checked and corrected if necessary. 1951 ALL SERIES – Supplements 1951 Shop Manual as Noted. 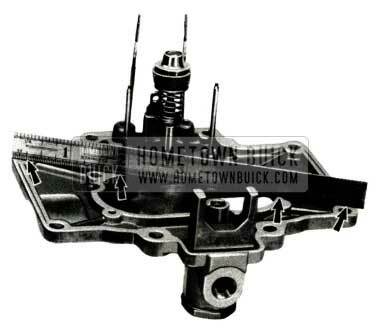 *Due to unavoidable circumstances, the new Carter carburetors will not be available for service through Buick Parts Warehouses. Note: Past type carburetors cannot be converted to new calibrations. The following is a reprint of Special Service Letter, Dealer No. 98, October 5, 1951, Subject: Prevention of Air Cleaner Blow-Up. Air cleaner blow-up can be prevented by venting the carburetor throttle body so that gasoline vapors will escape to the atmosphere while the engine is standing. This prevents vapor being pushed up into the silencer chamber. The correction consists of drilling a 1/16″ hole in each throttle bore. 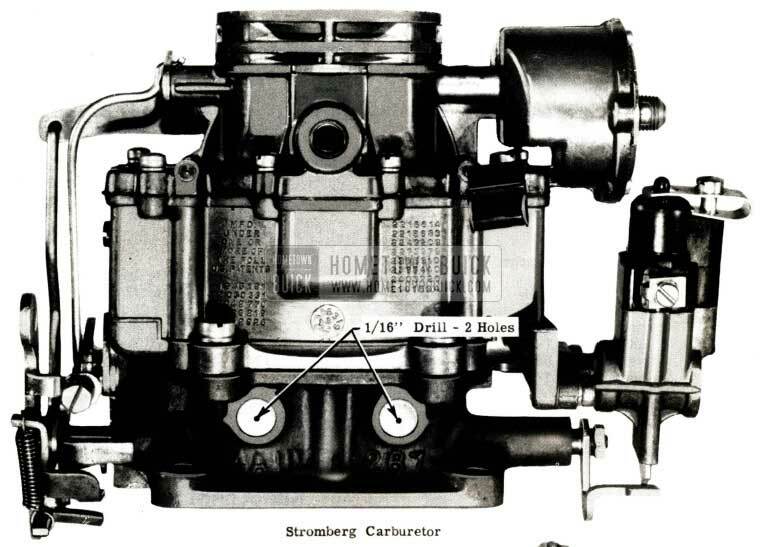 Stromberg carburetors should be drilled though the center of the Welch plugs at the rear of the throttle body. Carter carburetors are also drilled at the rear, but the holes must be located 7/8″ from the bottom flange and 13/16″ to each side of the center line of the boss that is cast in the center of the throttle body. 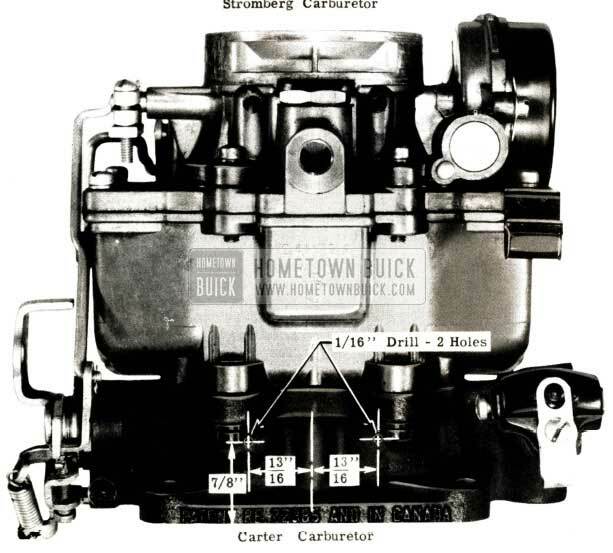 The drilling locations for both carburetors are illustrated in Figure 13. 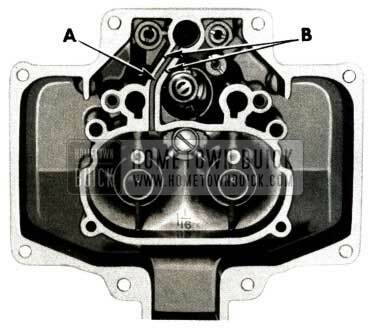 It is allowable to make this modification without removing the carburetor, provided care is taken to prevent chips from falling into the manifold. We suggest using grease on the drill tip. The vent holes are small and located in a low suction zone above the throttle valves. As a result, very little air” is bled into the carburetor while the engine is running and no metering corrections are necessary. 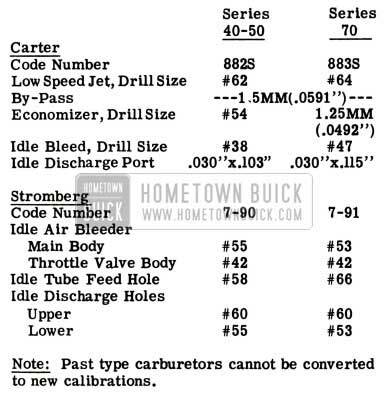 Some cases of erratic operation (such as stalling when making a quick stop or sharp turn) with 1950 and 1951 Carter carburetors having code numbers 725SA and 726SA, have been traced to use of the wrong air horn gasket. 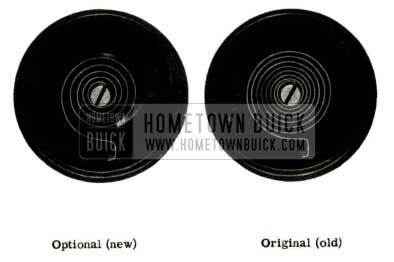 As you probably recall, the gasket design was changed when the bowl vents were relocated to the rear side of the air horn. In the event any of these carburetor gaskets are found to lack piercings at the bowl vent locations, they should be replaced with the correct Group 3.777, Part No. 1344078 Air Horn Gasket. We have established a flat rate operation for venting the carburetor throttle body as described in Special Service Letter, Dealer No. 98, October 5, 1951 and BPS 2.309, October 15, 1951, page 135. Carburetor Throttle Body: Drill two 1/16″ holes (Carter or Stromberg) .2 hr.